I’ve written a blog post for the LSE-based Democratic Audit website that summarises some of the work that my colleagues and I have done on the ESRC-funded Climate Policy and Political Parties project. This entry was posted in Uncategorized on 27 December, 2014 by conorlittle. Here is a short election review that I wrote a few weeks ago for an e-book edited by Marco Valbruzzi and Rinaldo Vignati that will be published by the Cattaneo Institute later this month. It describes the European Parliament election in Ireland and summarizes some of its implications. Update 14 July: here’s the published e-book, including my chapter (translated into Italian). This entry was posted in Uncategorized on 4 July, 2014 by conorlittle. Ahead of the Australian general election next weekend, I’ve written a short article for an Australian website, TheConversation.edu, on Green parties in governing coalitions. This entry was posted in Uncategorized on 3 September, 2013 by conorlittle. Brought in from the cold or marginalised? Women in the Hollande/Ayrault cabinet. So, the new French cabinet is gender-balanced: ten men (including the Prime Minister) and nine women. Rainbow Murray provides an expert view and makes some interesting observations here. Portfolio allocation has followed a highly gendered pattern, giving “stereotypically ‘feminine’ portfolios” to women. The one high-profile job that they have allocated to a woman (Justice) has gone to a low-profile candidate (Christiane Taubira). Her relative lack of profile reduces the likelihood that she will challenge the senior cabinet figures. And, of course, Martine Aubry was passed over for the position of Prime Minister. All in all, according to Murray, the new cabinet is characterised by the “meagre status accorded to women”. The post prompted me to look at some data provided by James N. Druckman and Paul Warwick, who did an expert survey (article here, gated), on the basis of which they allocated scores to each portfolio depending on its importance. Do their data bear out the picture painted by Murray of the marginalisation of women in the new cabinet? In a word, yes. 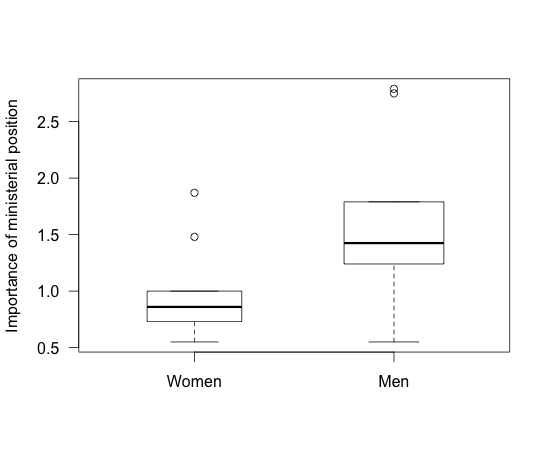 The distribution of ministerial importance between men and women is indicated by the boxplot below. The positions held by women in the new cabinet get an average score of 1, while those held by men get an average score of 1.6. If we exclude the Prime Minister, the male average falls to 1.48. What is the distribution of ministries like between men and women within the Socialist Party? There are two non-Socialist Party ministers in the cabinet, and they are both women: Cécile Duflot of the Greens and Christiane Taubira of the Parti Radical du Gauche. Both got relatively important positions. (Arguably then, Socialist Party women paid the price of coalition, at least in terms of senior ministerial office allocation.) If we leave these two non-Socialists aside, the average importance of the positions attained by the seven Socialist Party women is 0.81. In other words, PS women have received positions that are, on average, half as important as the positions attained by PS men. First, Druckman and Warwick’s data is based on a survey that was carried out about ten years ago, and refers to the period until 2000. As far as measuring ministerial importance goes, however, it is the best resource that I’m aware of, at least for crossnational comparisons. Perhaps an expert on French politics can point me to other, country-specific data. Second, the fit between Druckman and Warwick’s data and the new cabinet portfolios is not always perfect. Where there were two portfolios combined into one position, I simply added them together (e.g., for Duflot’s position). This method is not perfect. For example, it makes Moscovici’s position at least as important as Ayrault’s. (For more on this, see a working paper on ministerial careers written by myself, Jon Bright and Holger Doering, here.) However, there are only three such positions (two male and one female). For one position (Minister for Women and government spokesperson, attained by Najat Vallaud-Belkacem of the PS), there was no match in the data. For this position, I imputed a score of 1. This is the notional ‘average portfolio’ score that is built into Druckman and Warwick’s survey. It indicates that this position is a below-average position within this cabinet; I’d be interested to hear a country-expert’s view on this one. This entry was posted in Uncategorized on 17 May, 2012 by conorlittle.